Harry Kernoff – Up the Workers’ Republic Ireland. 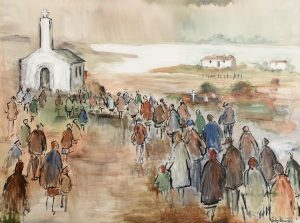 Up the Workers’ Republic, Ireland is the title of this arresting watercolour by Harry Kernoff RHA (1900-1974) which sold for a hammer price of 1,600 over a top estimate of 1,200 at Whyte’s sales of Irish and International Art in Dublin. 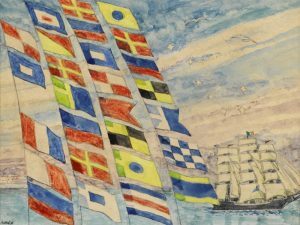 The title of the work appears in nautical code (the International Code of Signals) on the rows of the flags. The auction grossed 850,000 with 78% of lots sold. More than half went for over the top estimate. Over 250 bidders competed in the room, on-line, on the book or on the telephone. In this auction only 20% of lots sold went to internet buyers, which is lower than in previous art sales. 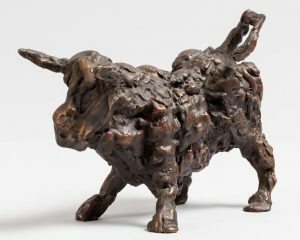 Auctioneer Ian Whyte said that they are very pleased with this confident start of the 2017 series of art auctions, continuing the trend set in 2016. 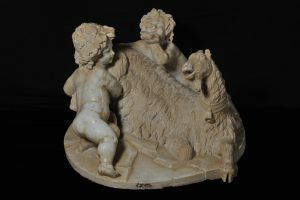 Whyte’s will host an internet auction on April 3 and their next sale of Important Irish Art is on May 29. 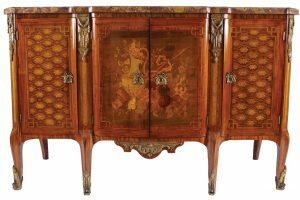 Art, furniture, clocks, silver and porcelain once housed at Ballynahinch Castle, Co. Galway will come under the hammer at the two day Fonsie Mealy sale in Castlecomer on March 7 and 8 next. Latterly housed at a gothic revival house known as The Aske at Shankill, Co. Dublin the Ballynahinch lots will include paintings by Gerrit van Hees, Theobald MIchau and Frank McKelvey. The auction will include collections from private clients including paintings from the Murnaghan collection. 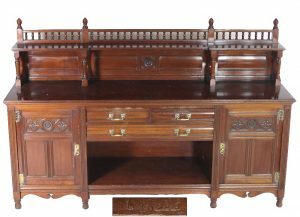 An arts and crafts dining suite by Gillows which has been in the possession of the Harding family of Tulach Nore, Co. Laois for 100 years. There is a collection of taxidermy by Derek Frampton, whose work can be found at The Natural History Museum in London. 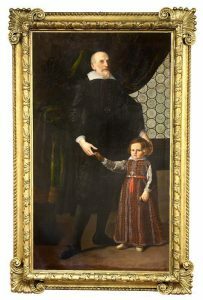 Among the Old Master paintings is a suite of 17th century portraits attributed to the Flemish painter Justus Sustermans (1597-1681) estimated at 40,000-60,000. This portrait of The Godolphin Arabian by the Irish artist Daniel Quigley comes up at Bonhams sale of the contents of Glyn Cywarch, the property of Lord Harlech, in London on March 29. 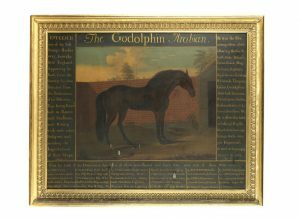 Godolphin was one of three horses brought to England between 1689 and 1730 from which all modern thoroughbreds descend including Sea Biscuit. Among the most successful of his progeny were Lath, Cedes, Regulus, Babraham, Dormouse and Bajazet. The horse was foaled in Yemen around 1724 and is said to have been given by King Louis XV of France to the Bey of Tunis in 1730. Later Edward Coke acquired him for his stud at Longford Hall, Derbyshire. Ownership passed to Francis, 2nd Earl Godolphin upon Coke’s death and the horse spent the remainder of his life at the Earl’s stud farm where he died on Christmas Day, 1753. Daniel Quigley’s portrait is thought to derive from an original, now lost, by David Morier, which was engraved and became a popular print. 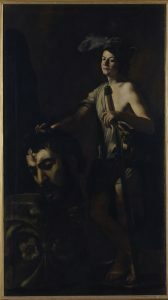 Other versions of Quigley’s portrait are in the National Horseracing Museum, Newmarket and the Paul Mellon Collection at the Yale Centre for British Art. 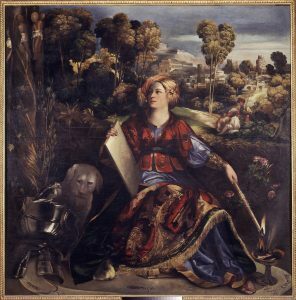 The painting is estimated at £15,000-20,000. UPDATE: THIS SOLD FOR £100,000 OVER FIVE TIMES THE ESTIMATE IN A WHITE GLOVE SALE WITH A 100% SUCCESS RATE. Francis Bacon’s Three Studies for a Portrait of George Dyer, 1963 will be a highlight at Christie’s Post-War and Contemporary evening sale in New York on May 17. It was formerly in the collection of author Roald Dahl, a friend of Bacon’s, and it has never been auctioned before. Dahl became an admirer of Bacon’s work when he first encountered it on a touring exhibition in 1958. 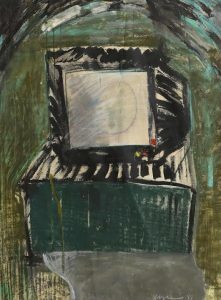 He was unable to collected it at that time, but after enjoying success in the 1960’s he acquired four works by Bacon between 1964 and 1967. The triptych here is one of these works. Painted in 1963, Three Studies for a Portrait of George Dyer marks the beginning of Francis Bacon’s relationship with Dyer, his greatest muse. This triptych is the very first portrait Bacon made of his lover who came to feature in many of the artist’s most arresting and sought after works. George Dyer came to appear in at least forty of Bacon’s paintings, many of which were created after his death in Paris in 1971. The convulsive beauty of this work represents the flowering of Bacon’s infatuation with Dyer, and is only one of five triptychs of Dyer that the artist painted in this intimate scale. It is estimated at $50=70 million. 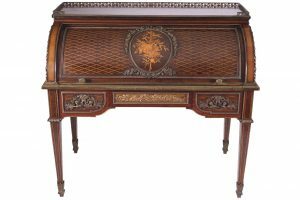 A Regency gilt bronze surtout de table (20,000-40,000) and a Louis XV parquetry commode (15,000-25,000) are among the top furniture lots at Sheppards two day sale in Durrow, Co. Laois on March 7 and 8 next. 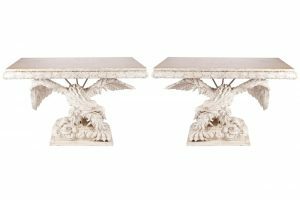 There is a similar 15,000-25,000 estimate on a large Irish side table by Mack Williams and Gibton originally from Loughton House in Co. Offaly, a pair of monumental carved wood console tables and a c1900 ormolu mounted roll top writing desk by Francois Linke. 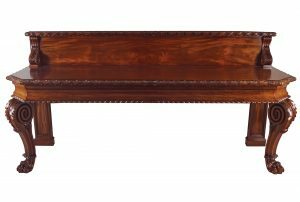 A c1790 French Hepplewhite silver table is estimated at 4,000-6,000 and a pair of mahogany satinwood and amboyna banded card tables by James Hicks is estimated at 3,000-5,000 in a sale with much interesting furniture. The catalogue is online. Here is a small selection. A Louis XV commode (15,000-25,000). 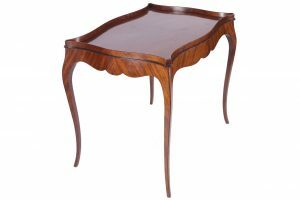 Large Irish side table by Mack, Williams and Gibton (15,000-25,000). A c1790 silver table (4,000-6,000). 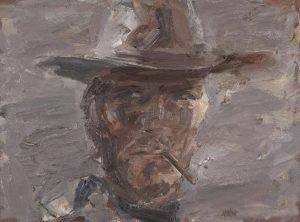 Clint Eastwood by Basil Blackshaw. UPDATE: THIS MADE 22,000 AT HAMMER. 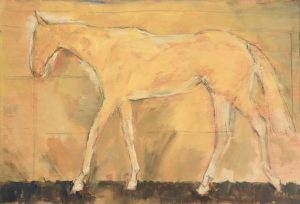 The Art of Ulster at the Ava Gallery on the Clandeboye estate outside Belfast from March 9-15 will include over 40 pieces from the studio of the late Basil Blackshaw. 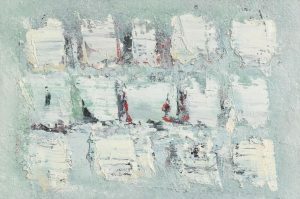 This is a preview exhibition of highlights from the next sale of Important Irish Art at James Adam, which takes place in Dublin on March 29. Prices for the Blackshaw works vary from 100 to 10,000 for his portrait of Clint Eastwood. The exhibition will include works by Paul Henry, Grace Henry, George Russell, Frank McKelvey, James Humbert Craig and Maurice Wilks. There will be a section on later 20th century Ulster art, or what is now referred to as the art of the troubles. This includes work by Dermot Seymour, Micky Donnelly, Jack Pakenham, Brian Ferran, Ross Wilson and Victor Sloan. In addition there are two sculptures from F.E. MacWilliam’s Banner Series completed at the height of the troubles in 1975. Painted days before the liberation of Paris Picasso’s Plant de tomates comes up at Sotheby’s Impressionist and Modern Art evening sale in London on March 1. 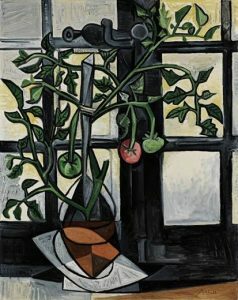 Picasso’s series of five paintings of a tomato plant in bloom in the Paris apartment he shared with his lover Marie-Thérèse are ripe with personal as well as wider political and cultural significance. Symbolic of victory in Europe they were a way of reflecting the spirit of hope and resilience that characterised this time. 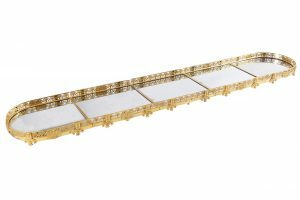 Estimated at £10-15 million this is the most complex and visually striking example of the war period series. 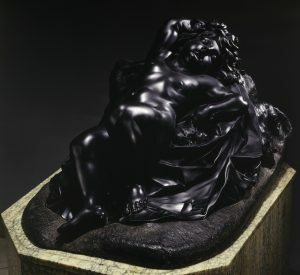 This museum quality work has been in a private collection for four decades. It was sold at Sotheby’s in New York in 1976. 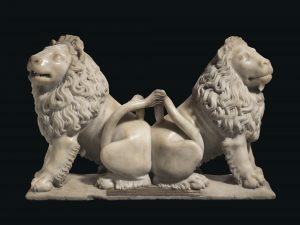 A re-discovered carved marble group of Two Addorsed Lions by André Beauneveu (circa 1335–1402) dating from 1364–66 will lead Christie’s Exceptional Sale in London next July. Originally executed to form part of the tomb of King Charles V of France at the Abbey of St. Denis, the addorsed or placed back to back lions were brought from France in 1802 by the English aristocrat Sir Thomas Neave (1761–1848), and have remained in the same collection ever since. Known to scholars only from an engraving of the 18th century, the emergence of these lions represents a remarkable re-discovery.